Slice cucumbers into rounds, regarding ½-inch thick. you'll be able to leave the skin on, peel them, or partly peel them for a stripy look. Slice grape tomatoes in [*fr1] (or quarters, if large) and put aside. In a bowl, mix cheese, Greek yoghourt, dill and Ranch dressing powder. combine completely. you'll be able to use an electrical mixer, however you'll be able to conjointly do that by hand. Transfer the cheese mixture to a piping bag (if you do not have one, you'll be able to use an outsized Ziplock bag with a corner snipped off). 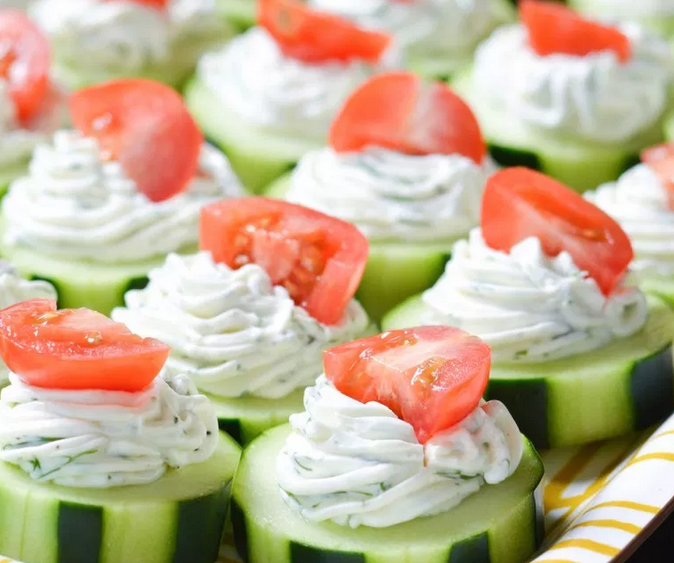 Pipe the cheese mixture onto the cucumber rounds, then prime with a cherry tomato half! 0 Response to "Dilly Cucumber Bites"